Welcome to the Seattle Glass Block Newsletter. You are receiving this because of your relationship with us. If you have any questions you can always email us directly at newsletter@seattleglassblock.com or call us at 425-483-9977 or toll free 800-829-9419. Join Us at the Seattle Home Show! Come see this Next-Generation, Ready for Tile Shower System before our big launch in March 2015 and receive Special Introductory pricing- save 20% off of regular list price!! All kits include Pre-Sloped Shower Pan, Brass Drain, Stainless Steel Drain Strainer, Corner and Straight Putty Knives and Fibrerglass Mesh Tape for reinforcement. 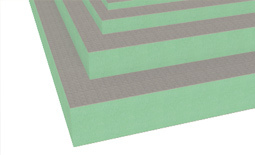 HYDRO-BLOK 48" x 64" Wallboard allows for optimized layouts (fits 16" stud spacing for less cuts and waste) with fewer seams and reduced installation time. We are excited to offer the Fleurco Glass Shower Enclosures. These high-end showers are offered at a great price and we know you will appreciate the quality. Please visit our newly remodeled showroom to see several of the Fleurco enclosures in person! **HOME SHOW SPECIAL PRICING-PURCHASE ANY FLEURCO SHOWER AND RECEIVE 10% DISCOUNT THRU MARCH 31, 2015!! Bowfront Shower - 34" x 60"
Still the #1 source for all of your Glass Block needs! We hope you enjoyed the information and articles included in this volume. If you have ideas for content or projects that you would like to see in future Newsletters, please contact us at sales@seattleglassblock.com or call us at 425-483-9977 or toll free 800-829-9419. As another year draws to a close we here at Seattle Glass Block would like to thank you for your continued partnership! We look forward to serving you in the coming year. CLOSED December 25th through January 1st. Best Wishes for the Holiday Season and a Happy New Year!! We are proud to be introducing the Fleurco Glass Shower Enclosures. These high-end showers are offered at a great price and we know you will appreciate the quality. In-Line Shower - 32" - 48" x 60"
We hope you enjoyed the information and articles included in this volume. If you have ideas for content or projects that you would like to see in future Newsletters, please contact us at newsletter@seattleglassblock.com or call us at 425-483-9977 or toll free 800-829-9419. Seattle Glass Block is pleased to announce that we are now a Distributor for the DRY-TREAT brand of World Leading Impregnating Sealers. Together with their Hanafinn line of innovative cleaners, we offer a complete stone sealing and stone care product line. We look forward to servicing DRY-TREAT dealers in Washington, Oregon, Idaho, Montana and Alaska. As many of you know, DRY-TREAT products are superior impregnating sealers with performance that is un-matched in the world of today's sealing products. The unique formulation of DRY-TREAT provides maximum depth of sealer penetration and creates a permanent chemical bond to the sealed material, resulting in permanent protection against efflorescence, salt spalling, freeze-thaw spalling and picture framing while still allowing the treated product to remain "breathable" so that any moisture below or behind the product can escape freely as water vapor. DRY-TREAT sealers provide maximum oil and water repellency for permanent stain protection of Natural Stone, Tiles, Pavers, Concrete, Terrazzo, Brick and Grout. Read on to see how DRY-TREAT sealers can give you the ultimate protection and help keep your materials looking like new throughout their lifetime. DRY-TREAT sealers are backed by a Manufacturer Warranty of 15-25 years (depending on product) when applied by a DRY-TREAT Accredited Applicator. Glass Flooring to the rescue! Project Photos, Stories, or Ideas to share? Join Us. Please note: We will be CLOSED December 24th thru January 1st for the Holidays! Happiness this Holiday Season and prosperity in the New Year. Thank you for being our customer. We look forward to continuing our relationship in the coming year. Come see us at one of the shows! Mulia Product Line Going Strong! A BIG THANK YOU to all of our customers that continued with us as we hit the ground running in 2012 with our latest line of Mulia Glass Block products. As many of you are aware, we experienced a relatively seamless transition as we introduced our new Thin Series line of glass block, complete with new shapes and patterns to meet the needs and wants of our customers. Together with our new Mulia Vinyl Stack spacer, hundreds of Glass Block Windows and Showers have already been installed with this beautiful and bright new line of products, while also offering the associated cost and weight savings expected from an efficient Thin Series product line tailored to the window and shower industries. We still have your commercial project needs covered as well. For the projects that truly need a 4" thick block, we can Special Order case quantities with relatively short lead times from the Mulia warehouse. Not surprisingly, our stock of Pittsburgh Corning blocks has been mostly depleted and effective Jan 1, 2013, all Pittsburgh Corning block will only be available by Special Order and will be subject to full case quantities, additional shipping costs and approx 3 week lead times. Going forward, we will not have price lists available for PCC blocks and as always you can call, fax or email us for any Special Order inquiries. Your next shower is just a few clicks away from concept to creation and installation! Click on the following topics to learn how we can help you with your next glass block shower system. Self Illuminated Glass Block Pavers! Easily transform your driveway, walkway, gardenscape and hardscape design with the latest Photovoltaic Glass Block technology. It couldn't be easier. Just set in place! Solar panel in the block collects daylight energy and stores it in an internal high capacity lithium battery. Ambient light sensor activates the battery and powers the high-luminosity LED lights through the night hours. Protect your surfaces with a permanent sealer that offers up to a 25 year written warranty when applied by a Dry-Treat Accredited applicator. The "No Fine Print" warranty means you won't be subject to exclusions or restrictions. Dry-Treat sealers penetrate deep and create a chemical bond to the material at the molecular level to become part of the material. The sealer cannot wear out or be removed by chemicals. This innovative technology out-performs anything on the market. Seal it once with Dry-Treat and never worry about having to re-seal..EVER! Interior or Exterior products can be treated with Dry-Treat. Specialty sealers can even strengthen softer stones like Sandstone and Limestone and will provide lasting protection from damaging salt attacks in coastal areas or around salt water pools. Eliminate unsightly efflorescence in your masonry and concrete and keep your materials looking as good as the day they were installed! Contact us today or click on the Dry-Treat logo to find out more about this incredible product line. Check out the case studies and see why Dry-Treat was chosen in 1991 as the sealer to protect the Sydney Opera House in Australia during its major upgrade and maintenance program. To this day its concrete surfaces remain protected from nature and the harsh coastal climate of the region. Glass Flooring may be more practical than you think. An urban remodel project near Seattle's City Center faced a dilemma. The entry way had an open foyer to the floor above that had been ringed with a handrail. With floor space at a premium, the owner wanted to gain the potential flooring square footage for a breakfast bar in the kitchen but was reluctant to simply fill in the unique rounded opening in the floor and effectively lose the design characteristic and close off what would become a dark and seemingly less spacious area at the main front door entry way. After hearing about glass flooring from a friend, a call was made to Seattle Glass Block and after submitting a few design ideas a creative solution was found that would fit the homeowner's needs and the budget. The idea was to fill in the opening completely with clear glass to gain the floor space desired while keeping a bright, open feel at the entry below. A few structural beams were added to the opening to support the glass. Templating was completed and the glass was fabricated and delivered to the job site for installation by our experienced crew. In a few short hours the customer had a beautiful new floor that has become a main feature of the home. As a bonus the customer noted how much more quiet the home has become with the glass in place and the opening sealed up. You may already have the perfect spot to add some glass flooring. Let Seattle Glass Block help you transform a space or create a new one. Call today or check our website for even more photos and project ideas. Project Photos, Stories or Ideas to share? If you are a designer, contractor, or homeowner and have completed a project recently using glass block, or glass flooring, we want to hear your story and share your experiences. Choose one of the social media sites or email us at newsletter@seattleglassblock.com to submit your completed project photos and share a brief story explaining some of the highlights of your project. First we would like to wish you a Merry Christmas! May you have a truly blessed holiday season this year, and thank you for your continued business and support. We look forward to working with you in 2012! Please Note: We will be closed in observance of the Holidays beginning December 24th - January 1st. Opening Monday January 2nd @ 8:00 AM. Seattle Glass Block is excited to finally introduce our newly designed line of glass block manufactured by Mulia Inc., a global leader in glass block for decades. This new line has a completely fresh look with a cooler color glass that gives a crisp and sharp presentation to all patterns, moving away from the common green glass from the past. In the past if you wanted to have a beautiful shaped glass block wall you were forced to use the bulky and more expensive 4" thick units. Those days are gone! We have known that the 4" thick glass block were much thicker and heavier than necessary however that is all that was made available until now. This 3" thin rounded Glass Block is not just curved on the exterior but is now curved on the interior as well for a much nicer finish inside and out. A 90 degree corner block also made for the improved 3" thin block line. You will notice the wider block face on the inside and outside corner allowing much more light to pass through as to not shade the block so it looks similar to the rest of the block wall units. Shower walls are by far the most popular application for the glass block. Chosen for the privacy and the ability of making almost any shaped configuration, creating a custom fit and design for your bathroom is easy! These days the tile choices have exploded and many tiled shower walls are feature walls that should not be hidden. Our new CLEAR line of glass blocks are a great choice to create a wall with unlimited design capability because we have made this line available in all 3" thin sizes and shapes. Yes we have changed to this new exciting line of glass block however you can still expect the high level of services and innovative systems Seattle Glass Block is known for. In most cases, change is difficult however this change will be made easy by allowing our great team to continue to guide and service your project needs. Seattle Glass Block will still have Pittsburgh Corning glass blocks available but a number of choices will be special order and will reflect their 2012 price increase. Our great new glass block line is NOT available at the Big Box Stores nor will it be so you won't have to compete with them for the same product. In addition this new line is available at a much more competitive rate and we have established better margins for dealers and contractors. What About Your Current Quote? Starting February 1st we are forced to pass along a significant price increase on all Pittsburgh Corning glass block products. We are honoring all existing quotes but they will expire on Jan 31st while 2011 inventory supplies last. Please call your sales representative to re-quote any existing projects you have with us now, so you can see the nice savings our new glass block line has to offer. We are working on a number of other new glass block product innovations and we are looking forward to our next introduction, hopefully within the first half of 2012. So keep your eyes open and I am sure you will agree that this next product is a wonderful addition, one that you have never seen before. Replace your old bathtub with a new glass block shower! Update your old windows with real glass block, and add security! Glass Stairs were a great fit for this Northwest style residence! Bone Yard Panel #446 now available at 50% off retail! Click here to see pricing for this panel and more great deals! Bone Yard Panel #427 now available at 50% off retail! Click here to see pricing for this panel and more great deals! We are proud to announce we will be taking place in the Seattle Home Show and you can find us at booth #819. We will have experts there to help answer all your Glass Block & Glass Flooring questions. Turn your basic tub or shower into a custom door-less shower with a beautiful radius glass block wall. We can supply an Acrylic or Ready-4-Tile shower pan, the waterproof wallboard, and the glass block wall as a complete kit. Check out the photos below to see just how easy this is. Update your old window with a new real glass block window! Glass block is available in several different sizes and patterns that can be combined to fit an existing window opening. Windows can be prefabricated in Vinyl Wrap frames with nailing fins for easy installation, or as Frameless Panels for a smooth transition between the block and surrounding finishing materials. Glass block can be combined with several types of operable units such as sliders, or vents to allow fresh air ventilation. Check out the Vinyl Wrap section on our website to view our glass block window options. With Cogir Glass Blocks you can add fusion art to your next glass block project. Combine the beauty of glass block and glass fusion art. Hundreds of designs and colors to choose from and customize. Suitable for interior and exterior applications. Glass Block Banks Make great Gifts! Project Photos, Stories, or Ideas to share on our Blog? Please note: We will be CLOSED December 24th from Noon thru January 3rd 8 AM for the Holidays! Glass Block Banks Make Great Gifts for Under $5.00! You can also use the 8x8x3 Mist Universal Glass Block to light up the Christmas Tree! Project Photos, Stories, or Ideas, for our Blog & Facebook? If you are a designer, contractor, or homeowner and have completed a project recently using glass block, or glass flooring, we want to hear your story and share your experiences with our Blog and Facebook followers. Please email us at newsletter@seattleglassblock.com to submit your completed project photos and share a brief story explaining some of the highlights of your project. When times are slow the transition from general contractor to generally doing everything to keep busy can be challenging. Being a "Jack of all trades" without "jacking" up the project can be difficult. In an ideal world, you wish that every box of material you opened would instantly give you the skill of a journeyman for each specific trade. That is exactly what we are offering you today, a variety of total custom products and trades to keep you busy, successful, and profitable. Seattle Glass Block is proud to announce we will be taking place in the Seattle Home Show 2 and you can find us at booth #819. We will have experts there to help answer all your Glass Block & Glass Flooring questions. We will be displaying Tub Replacement Shower Kit, as well as our Vinyl Wrap and frameless glass block windows. 12" x 12" Argus Pattern glass blocks were selected by Toth Construction and their client to construct a 58' long by 5' tall wall along the back edge of the client's property. The glass block wall was specified to act as a sound and a privacy barrier between the property and the alleyway running behind the lot. Glass block's resistance to damage from vandals was another contributing factor in its selection for use in this wall. The vertical flutes of the Argus glass block were oriented to face the interior of the property in order to complement the slim vertical stalks of the bamboo that was planted just inside of the glass block wall. Glass Hue color Style Caps were used along the top and on the open ends of the wall to provide a finished edge, and Warm Gray color Mapei grout was used in the face joints between the blocks to blend in with the concrete used in the foundation of the wall. Planning and construction of the wall and its support columns required close communication and coordination between Seattle Glass Block, Toth Construction, among other trades working on the project. The wall sections, the majority of which measured 8' long, were prefabricated in our shop using the versatile Stack & Grout system and brought to the job site in modular sections. This allowed us to set all of the wall sections in one day. The joints between the modular sections were grouted the next day, along with the perimeter sealing of the panels with silicone caulking. By coordinating during the planning stage, Seattle Glass Block was able to provide this general contractor with a quick and efficient installation that provides this client with a beautiful addition to their property for years to come. A new trend is catching on with the use of structural laminated glass to create a walk-able skylight and a wonderful source of light for your outdoor living space below. Structural glass flooring offers a slip resistant coating and can be as clear or obscure as you need depending on the level of privacy required. If you're considering glass flooring for your new construction or remodel, let us help you figure out how to incorporate glass flooring into your design ideas. We can assist with construction details and recommend sizes & layouts to keep your project as cost efficient as possible. Seattle Glass Block supplied 8x8x3 VISTABRIK® and 8x8x3 VISTABRIK® Stipple blocks to the masons constructing the Beacon Hill Station for Sound Transit's LINK Light Rail. Thousands of glass blocks were used throughout the rail station; in the entry façade, above the elevator banks, and lining the stairs. The blocks lining the stairs and above the elevators are back-lit to illuminate the ticketing concourse with a warm, welcoming glow. VISTABRIK® Stipple blocks were fabricated in tandem with 8x8x4 Decora blocks for two-block accents mounted in the masonry wall below the main VISTABRIK® walls. VISTABRIK® was selected for this project for its durability, longevity, and ease of maintenance. VISTABRIKs® are impact resistant and virtually unbreakable, easily resisting thrown objects and vandalism. The smooth surface of the block aids in quick removal of graffiti and resists damage from chemicals and cleaning compounds. VISTABRIKs® are made of three inches of solid glass, which acts as a barrier to unwanted sounds. Help us clear out of the following products at great savings to you. Now Only $505.00 was $876.00 retail. The Classic shower pan is approximately 48" x 48" and the drain is located 22 ½" from either side of the pan. This pan is in perfect condition and ready to be installed. For pictures & details on the shower pans please see our Facebook page. The Walk-In shower pan is approximately 51" x 72" and the drain is located 36" off the short wall and 9 ½" off the long wall. This pan has a slight chip out of the perimeter flange, but does not affect the integrity of the shower pan. Once the shower pan is fully installed the chipped area will be covered with wallboard and tile. For pictures & details on the shower pans please see our Facebook page. These panels are available at 50% off of our retail price. They range in a variety of sizes, patterns, and finishes. Some of the panels have Style Caps applied to them so you can use them for partitions or in the shower. Our list is updated regularly so please check in with us to see if the panel you want is available. All discounted products are sold As-Is and all sales are final. Seattle Glass Block is proud to announce we have joined the Facebook revolution and created a company Facebook fan page! This is very exciting for us to be able to connect to our fans and share everything from installation and maintenance tips, to how glass blocks are made, or anything that's on our mind from day to day. We have also created a company Blog. The blog will be a way for us to announce new product offerings, feature cool customer projects, or simply illustrate installation tips or tricks that may be valuable to you on your next glass block, or glass flooring, project. Our display features a complete Glass Block shower and our NEW Tub and Shower Replacement Kit. We will also be showing a radius glass flooring and stair tread display along with the IBP GlassWalk floor. Please visit our booth and talk with one of our Customer Service Representatives about your upcoming project(s) for professional assistance. Seattle Glass Block makes it easy to plan your next glass block project. Using our Online Planner you can select your type of project from a list of several of the most popular glass block applications. Our planner will walk you through the design process starting with a basic configuration, then moving on to block pattern choices, edge finishes, frame colors (for Vinyl Wrap windows), concluding with purchase options. Depending on the application and your location, Seattle Glass Block can offer loose materials, prefabricated modular sections, or even installation. Once you've completed the Online Planner, you have the option of submitting your planner request via email to our sales staff. Our goal is to reply to your planner request within one business day. Rest assured that Seattle Glass Block does not send unsolicited emails or advertising, and that any information that you submit is used solely for replying to your Online Planner request. Get started today by visiting www.seattleglassblock.com. Click on 'Pricing Examples', and then select the category from the menu that best describes your glass block project. Do you have a unique glass block layout? Let Seattle Glass Block install your glass block panels in less than a day (for most projects). This project is a shower enclosure that Sockeye Construction contacted us to install. The glass block walls were stepped to create an open design in the bathroom and to keep the view of Puget Sound unobstructed. With the use of our Layout Cards Sockeye Construction was able to frame the radius half wall to match the glass block layout for this bath remodel. Layout Cards are vinyl pieces that snap together onsite and recreate the block shapes and sizes. They are available in every block shape and size we offer. These cards are lightweight so they can easily be shipped and are reusable for multiple projects. We arrived onsite with our prefabricated panels and installation was completed in just under 3 ½ hours. Day lighting is very important and highly desirable in the Pacific Northwest, and glass inserts used as decking is growing in popularity. In this example these skylights are being used to transfer light into an outdoor living space below. Download the latest IBP GlassWalk™ Brochure here. Seattle Glass Block can prefabricate your glass block in modular sections for easy, fast, and clean assembly onsite. We use our Stack and Grout system to build your glass block panels in our facility on controlled racks and jigs for perfect joint alignment and fit every time. Jobsite installation is easily performed by anyone with basic construction skills. With years of experience we have perfected palletizing shipments for safe, low cost shipping nationwide. Contact our Sales Team for more information on your project and a free quote for Modular Glass Block Walls from Seattle Glass Block. We offer prefabricated Glass Block Windows constructed in Vinyl Frames available in white, almond, and a variety of custom colors. These windows install like any other vinyl framed window. The 2" series of glass block is available in Decora or Icescapes pattern and we offer several stock sizes for immediate shipment. The 3" & 4" series offers a variety of block patterns, plus numerous options for customization. These Vinyl Wrap windows can be stepped, vented, or include a slider top and can be shipped nationwide. Click here to download the complete Vinyl Wrap catalog. The private residence shown here has been updated including replacing the existing window with our vinyl framed Glass Block window in the Icescapes pattern. Kaizen Tile & Stone did the tear out and installation of our window for a fantastic looking bathroom remodel. With a large skylight on the second floor, this glass was a fitting solution to transfer light from above as well as from the side. We will be closed Friday, July 3rd in observance of Independence Day. 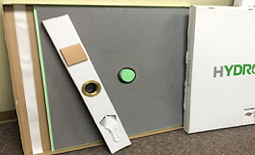 Our Tub & Shower Replacement Kit can be modified to fit your customer's needs! This project was installed by Handyman Matters. They took our standard kit and customized the glass block wall and shower pan to fit their customer's preferences. Using Pittsburgh Corning Decora & Icescape blocks, they were able to create an interesting and unique chevron pattern. The glass block wall was stepped to reflect the same chevron design. This allowed us to change the drain location and increase the overall width of the pan as their customer requested. From start to finish, this project was completed in just a few days, including tear out and installing all new tile! Seattle Glass Block offers free computer design service and above is an example of how we are able to turn your ideas into a 3-D sketch. If you need help with a shower designs, we can take your concepts and turn them into sketches with true glass block dimensions. If you have the need for a tub replacement and/or glass block shower, contact us to see how we can customize this kit for you. Click here to download the brochure on our Tub & Shower Replacement Kit. The state of Washington requires all private and public docks to allow 60% of the light hitting the surface of the dock to penetrate into the water below. This light penetration can be an Architectural challenge as most products that allow light to flow through, such as grating can be tough on the feet, and usually not very attractive to look at. One possible solution to this challenge is laminated glass decking. Laminated glass offers excellent slip resistance, visual appearance, and transmits 89% or more light through to the water below. Did you know we offer installation? With Seattle Glass Block's professional install crews, we can offer jobsite installation on any glass block application ranging from a prefabricated 16" x 16" Vinyl Wrap window for a homeowner's remodel project on up to an 18' tall, 20' radius on-site build for a commercial building. As the Pacific Northwest's glass block experts, Seattle Glass Block is often called upon when large or complex glass block builds are required. For example, several of the LA Fitness Centers feature a large rotunda enclosing the hot tub area. In many cases, Seattle Glass Block was subcontracted by the Mason to perform the installation of these radius glass block walls that reach as high as 18 feet. With close cooperation between Seattle Glass Block, structural engineers, onsite superintendants, and other sub-trades, the installation of the glass block is typically accomplished injust a few days. Contact Seattle Glass Block to help plan, and perhaps even install your next glass block project! A spiral staircase constructed of opaque materials would have created a dark space. By utilizing structural glass stair treads along with a glass railing system, maximum light from above was transferred to the lower living area of this residence. Photo's courtesy of David Bedford - Spiral Staircase Systems, Inc.
Seattle Glass Block prefabricates 45 & 60 Minute fire rated window assemblies with a variety of Pittsburgh Corning� glass block patterns available. Our Fire Guard™ windows are fully manufactured and ready for delivery. Once onsite they simply fasten into place. Refer to the Underwriters Laboratories� installation requirements & local building codes for fire rated window assemblies. Interior and Exterior installation details are available. Typical Fire Guard™ applications include Multi Unit Housing, Limited Lot Line Communities, Corridors, Stairwells, as well as other fire rated uses. We offer on site installation of 90 minute rated assemblies, curved window assemblies, and applications too large to prefabricate - up to 120 square feet. Contact our sales staff for more information on our Fire Guard™ window assemblies. Click here for more details on fire rated glass block. Our display features a complete Glass Block shower and our NEW Tub and Shower Replacement Kit. Please visit our booth and talk with one of our Customer Service Representatives about your upcoming project(s) for professional assistance. Welcome to the first edition of the Seattle Glass Block Newsletter. We will be producing this Newsletter approximately every two months and focusing on upcoming events, projects, products, and installations to keep you informed. You are receiving this because of your relationship with us. If you have any questions you can always email us directly at newsletter@seattleglassblock.com or call us at 425-483-9977 or toll free 800-829-9419. Turn your basic tub or shower into a custom door-less shower with a beautiful radius glass block wall. The Shower Pan and Glass Block Wall installs in just a few hours. The kit includes an Acrylic Shower Pan with a Brass No-Caulk Drain, assembled Modular Glass Block Walls with Glass End Style Caps, Finishing Grout, Anchors, Screws, Shims, Silicone, Screws, and Washers. With large floor to ceiling windows the glass floor and stair treads are the perfect custom touch to show off the expansive view of Puget Sound, and the ideal solution to create a spacious feel while also admitting an abundance of natural light. In this project for Dale Miller Construction Services we built a 90" x 48" Glass Block Panel around three Marvin windows. We worked with Dale and his representative at Marvin to get the required openings & block dimensions. Dale dropped off his windows and we surrounded the frames with 6x6x3 Decora� Glass Block. We arrived at the Walker residence in Redmond, WA with the panel prefabricated in two sections and this project was installed in less than three hours. From design to installation, Dale was impressed with our services and we look forward to working with him again soon. Our display features a complete Vista� Glass Block shower and our NEW Tub and Shower Replacement Kit. We will also have a complete radius Glass Floor and Stair Tread display. Please visit our booth and talk with one of our Customer Service Representatives about your upcoming project(s) for professional assistance. Please see below how you can qualify for free passes to this year's show! Receive FREE PASSES to the Seattle Home Show! From now until February 20th, every order placed with Seattle Glass Block qualifies you for 2 FREE PASSES to the Seattle Home Show at Qwest Field February 14th-22nd. Limit 2 per customer. Please contact Seattle Glass Block for further details.